Carrie Reichardt is a craftivist whose work blurs the boundaries between craft and activism, using the techniques of ceramic and mosaic to create intricate, politicised works of art. Carrie trained at Kingston University and achieved a First class degree in Fine Art from Leeds Metropolitan. In 2015 she spent 2 months as the International visiting artist at The Clay Studio, Philadelphia, USA. Carrie has been involved in international community and public art projects for over two decades. She has designed and consulted on largescale mosaic murals and completed public projects celebrating with local communities in Mexico, Chile, and Argentina. Her most recent ceramic installation was for the facade of the Victoria and Albert Museum, whilst her Tiki Love Truck, a ceramic-adorned vehicle, was the star exhibit inside as part of the critically acclaimed Disobedient Objects exhibition. The Tiki Love Truck – commissioned by ‘Walk the Plank’, specialists in outdoor performance, this mosaic-covered pick-up truck, was dedicated to the memory of a death-row inmate. Winning first prize at the inaugural parade in Manchester, the truck has since participated in the Illuminated Parade in Blackpool and the Glowmobile Parade in Gateshead. Trojan Horse –a life-sized resin horse, with a skull for a face and coated in a mosaic of hard hitting facts about the abuse of horses, made in collaboration with sculptor, Nick Reynolds. An audacious protest against equestrian cruelty, displayed at the Cheltenham Festival Races, the project was featured in The Guardian. The Milan Elephant Parade – Carrie and Nick Reynolds’ elephant was inspired by the revolutionary spirit spreading across the world. The elephant was displayed outside the Triennale de Milan Museum of Art. Mary Bamber – Carrie’s life-sized ceramic-adorned figure of the revolutionary socialist, Mary Bamber, is now on permanent display at the Museum of Liverpool. 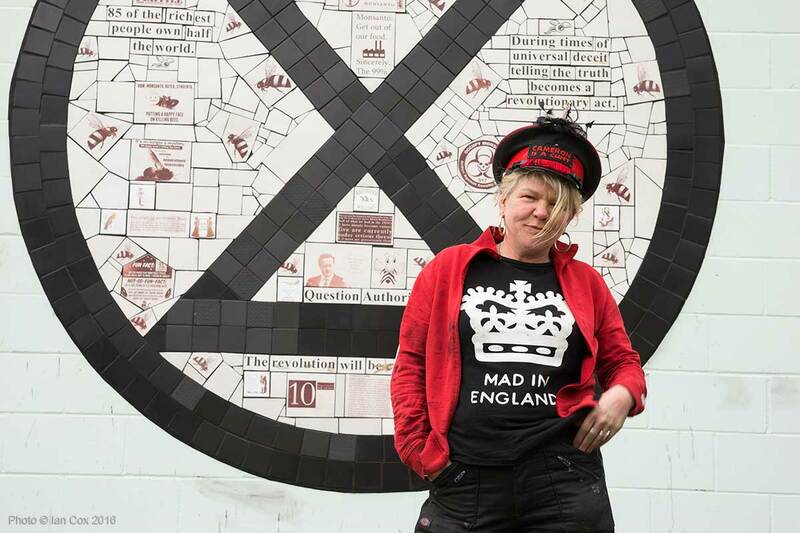 Carrie Reichardt’s work has featured in the press including, The Observer, The Guardian, The Evening Standard, Tile and Stone and in several books including; ‘1000 Ideas for Creative Reuse,’ Garth Johnson, ‘Mural Art No 2’, Kirikos Iosifidis and ‘The Idler 42 – Smash the System’ – Tom Hodgkinson. Every day I read about the annihilation of the planet and the extinction of yet another species. Powerful corporations and corrupt governments are destroying entire eco systems for profit. If we don’t fight back there will be nothing left. I know that art is the most powerful tool we have to bring about social unity. As a practitioner within the extreme craft movement that works as both a community and public artist, I produce highly politicised pieces. Through working with international communities, I have come to see how artists can act as conduits and aid others in finding their own personal creative voices. I find it beautiful how this process allows for a dialogue to open where there might not otherwise have been one. My own personal work embodies this notion of art serving as a conversation starter for topics that may be difficult or divisive. For the last ten years I have specialised in the transfer of image onto clay, and become passionate about making work that conveys the people’s history. By doctoring an eclectic range of imagery and juxtaposing simple words and sayings, I invite viewers to re-think their entrenched beliefs and ideas. My work is an extension of my activism and all my creativity comes from a desire to bring about equality and justice. The beauty of craft is that it hooks into a primitive part of our psyche, one that helps challenge viewers both emotionally and intellectually.